The first half of 2018 was met with expected increases in resale condominium listings, and this year the choices were far greater than in the previous two years. 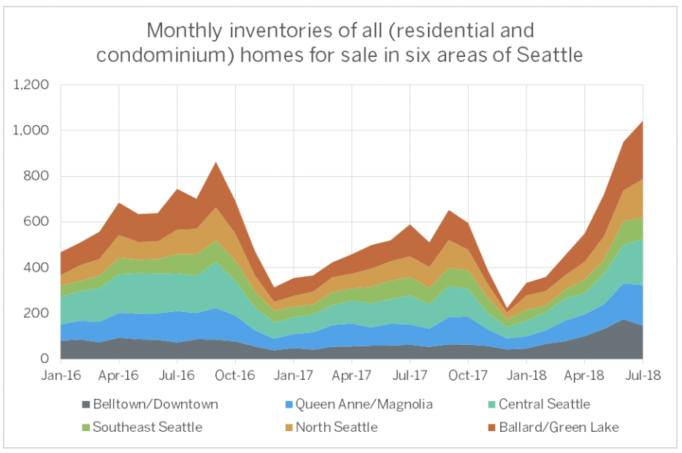 Much of this anticipated new inventory came amid a broader surge in listings around Seattle and the Eastside, which began mounting in May 2018. Realogics Sotheby’s International Realty addressed this rush to list in an August 1 blog post, “As Home-Buying Trends Shift Nationwide, Seattle Forges Ahead.” We suspect that it was an early arrival of a typical mid-summer influx of new sellers spurred by nationwide market observations, many more perhaps motivated to strike while interest rates remain low or in reaction to the now-repealed City of Seattle job tax. Regardless of the added supply, sales activity remained stable year-over-year. Consider that the average price per square foot of a downtown Seattle condominium has increased by 20 percent from $726 to $873 in just a year[WH1] . Alert to the run-up in prices, sellers with an eye on trends in other markets may be anxious to sell, especially noting past generation product will need to stand up to new construction being introduced. Meanwhile, cities elsewhere around the country and in neighboring Canada are seeing outright declines in market demand and falling prices. Why should Seattle be any different? PICTURED ABOVE: Inventory levels of housing shows a very routine pattern of increased supply through the early fall and a sharp decline each winter. The 2018 pattern appears to show greater expansion compared with prior years, especially following a very anemic winter season in the in-fill neighborhoods of Seattle. Given the ongoing concentration of business and industrial activity downtown, Seattle’s condominium supply has a lot of catching up to do. We are nearing the end of a multi-year dearth of new construction, with zero new condominium inventory delivered in 2017. So the new market entrants we have been seeing of late are not leading the market, they are chasing latent demand. This is easily demonstrated by the speed at which new offerings have been pre-sold. The Gridiron in Pioneer Square did deliver in 2018, but it was substantially pre-sold; today, only 21 homes of the 107 offered remain available (i.e., 80 percent have sold). It’s a similar story at the 389-unit NEXUS, which recently pulled their remaining eight percent of homes (92 percent pre-sold) homes off the market in favor of re-introducing them closer to occupancy in fall 2019. Close behind is KODA, but again, 95 percent of these homes have been reserved for priority pre-sales earlier this year. More pre-sale projects are anticipated, including SPIRE—a 352-unit high-rise near the Space Needle. Yet the rising cost of construction suggests that newer builds will need more than $1,200 per square foot on average to pencil. Recently, The Puget Sound Business Journal reported the introduction of low-rise condominium development at SOLIS—a new, for-sale development at the corner of 13th and Pike Street on Capitol Hill. Furthermore, BDR Urban is set to introduce a 96-unit condominium in Columbia City at the foot of the LINK Light Rail line this fall. And a new developer group called the Neighborhood Collection will soon offer 133 condominiums in recently constructed buildings on Capitol Hill and in Wallingford in the hopes of offering ownership options below the median resale asking price, which is now $838,000 in downtown Seattle. So, what do these new projects have in common? They will fill an largely unmet, but growing demand for shelter by buyers not well served by other offerings on the market today. Notwithstanding the increased supply seen in late spring, median home prices (excluding new construction) increased by 18% to $700,000, which is effectively the peak price of a conforming loan limit ($667,000 plus 5% down payment). If median home prices continue to increase at this rate, a buyer of a median-priced downtown condominium will require a jumbo mortgage, with more down payment (typically 20 percent) and a higher FICO score needed to qualify, and at higher interest rates. That’s where affordability becomes a greater concern, as there are far fewer consumers able to save up for the increased earnest money deposit. As a result, the bottom half of the market is more likely to witness steeper price increases, further unbalancing supply and demand. The fact is, downtown Seattle housing is reaching the same prices as the single-family homes that surround the city center. Developers see the lack of attainably-priced homeownership options in the high-rise zones and seek to deliver on the more attractive price points with quicker construction deliveries – stay tuned for more high quality wood-framed and steel-framed communities in the close-in neighborhoods that surrounded the high-rise zoned areas. And with the goal of affordability, most homes will be offered with parking optional as consumers today (mostly first-time buyers and savvy urbanites) realize the roadmap to ownership is more likely without the expense or the hassle of cars in one of America’s most walkable cities. Recent studies show that Seattle already possesses an overabundance of parking, such that few cities in the country are better positioned for higher-density development. Belltown and Downtown Seattle have reaped the bounty of new condominium development, due to high demand from employees at Amazon and other regional employers, combined with changing demographics and commuting behaviors that favor urban living, and favorable transportation investments by the City. These neighborhoods comprise the region’s premium market for condominium buyers. In 2018 Q2, seven condos in this area were sold at prices exceeding $2.0 million; five were sold between $1.5 and $2.0 million; and eleven from $1.25 to $1.5 million. 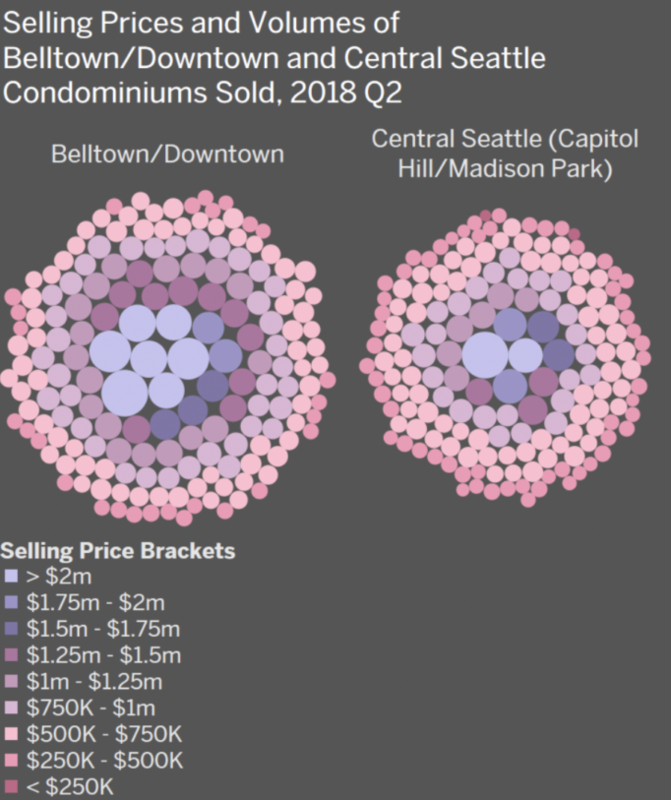 (Chart, “Selling Prices and Volumes of Belltown/Downtown and Central Seattle Condominiums Sold, 2018 Q2”). As to the late spring surge in listings described at the top of this story, such patterns are accentuated in a market hamstrung by short supply. For example, the condominium towers at Insignia in Downtown Seattle, having opened for occupancy in 2015 and 2016, (a) drove CDOM to zero in the relevant quarters because they were listed and went pending immediately upon closing; and (b) suppressed the year-over-year change in sales in 2017. Due to pre-sales, selling prices in those years were more closely aligned with listing prices than today, as re-sales of existing condos offer buyers more bargaining power. 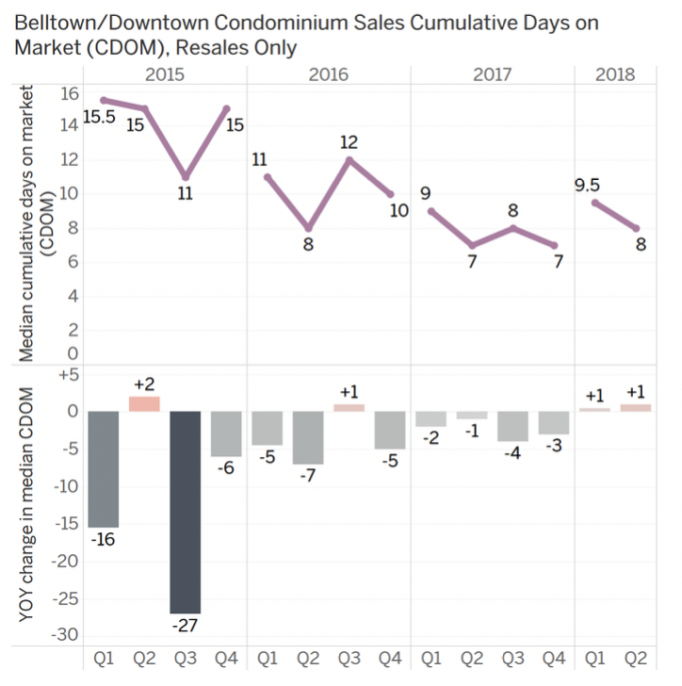 (Charts, “Belltown/Downtown condominium sales, days on market, and deviation from listed prices”). The need for more affordable units is acute, as Downtown unit selling prices and prices per square foot have steadily shifted into successively higher brackets. 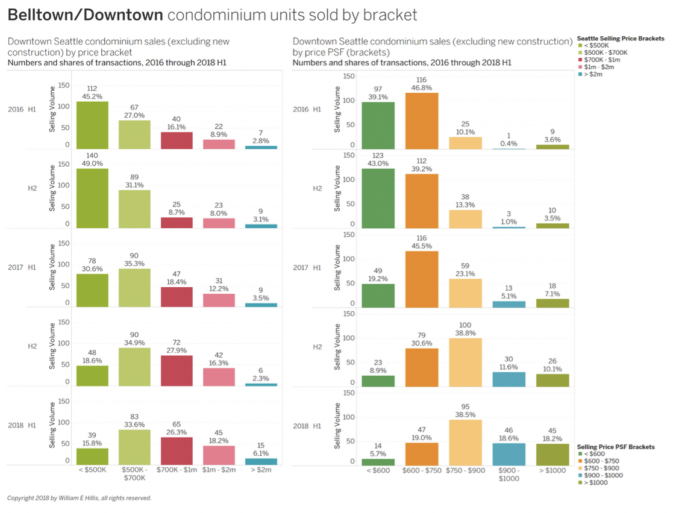 (Charts, “Belltown/Downtown condominium units sold by bracket”). 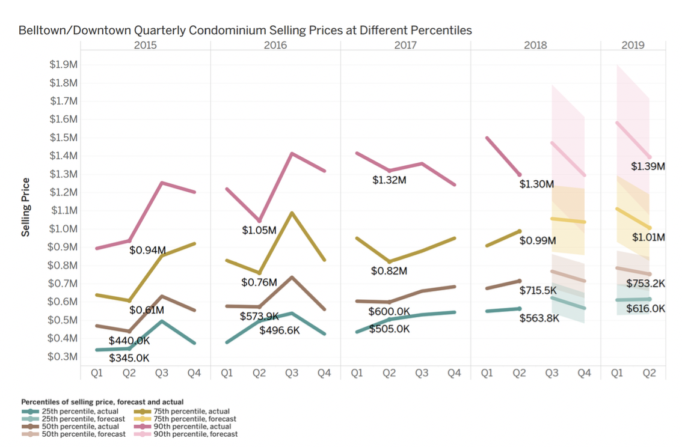 RSIR’s 2018 Q2 price trend and forecast shows prices in Belltown and Downtown keeping their upward pace below the top tier of listings by price. Selling prices below median are forecast to continue rising, while the 75th-percentile price is at the edge of a million dollars. 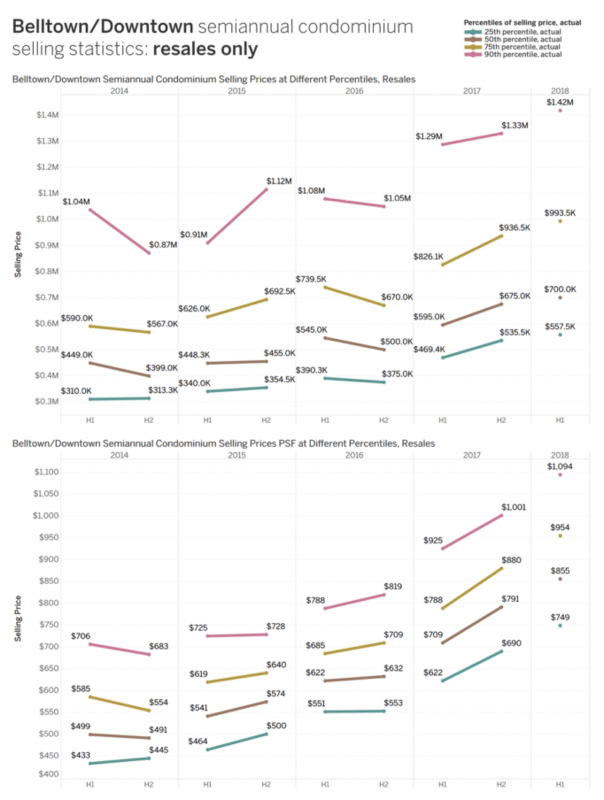 (Charts, “Belltown/Downtown Condominium Selling Prices at Different Percentiles”). PICTURED ABOVE: Comparing the first half of the year between 2016 and 2018 illustrates a potential vanishing point on the horizon for price points below $500,000 as the median home prices rise and developers struggle to deliver meaningful supply at affordable price points. Market times provide further assurance of sustained market demand, and corroborate the rapid reservation of newly-offered units. 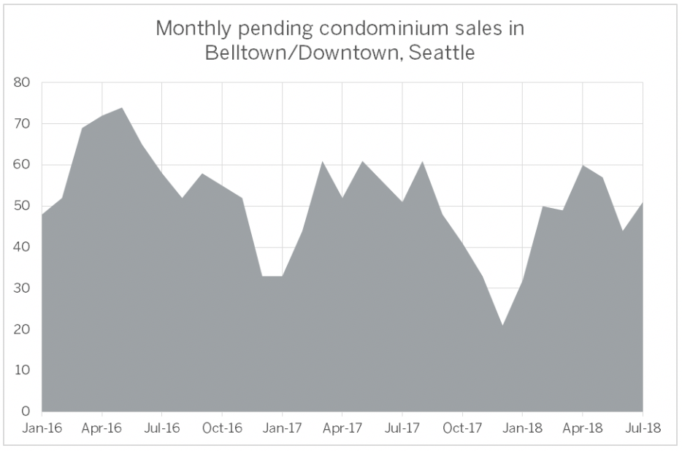 Separating new construction from resales of existing Belltown and Downtown Seattle condos smooths the recent path of quarterly sales and cumulative days on market (CDOM), revealing a halting, yet relatively steady contraction in market times for these units. 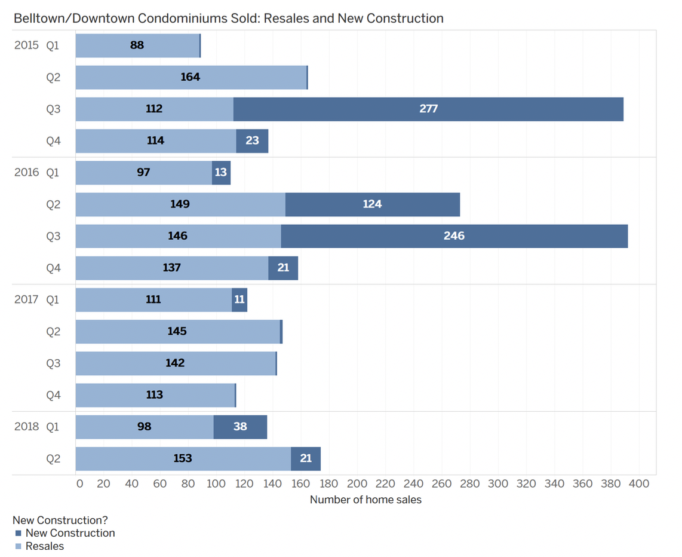 (Chart, “Belltown/Downtown Condominiums Sold: Resales and New Construction”). When opened for occupancy, new construction influences measures of condominium prices. In the second half of 2016, when the south tower of Insignia was occupied, resales only of condominiums sold for $500,000 and $632 per square foot at the median price, $670,000 and $709 per square foot at the 75th percentile. With Insignia included, the median price was $686,100 and $714 per square foot, while the 75th-percentile price was $1.04 million and $857 per square foot. In any case, demand is high and prices paid per square foot are rising faster than unit prices. The top one-tenth of condos sold by price in Belltown and Downtown Seattle surpassed $1,000 per square foot in the second half of 2018. 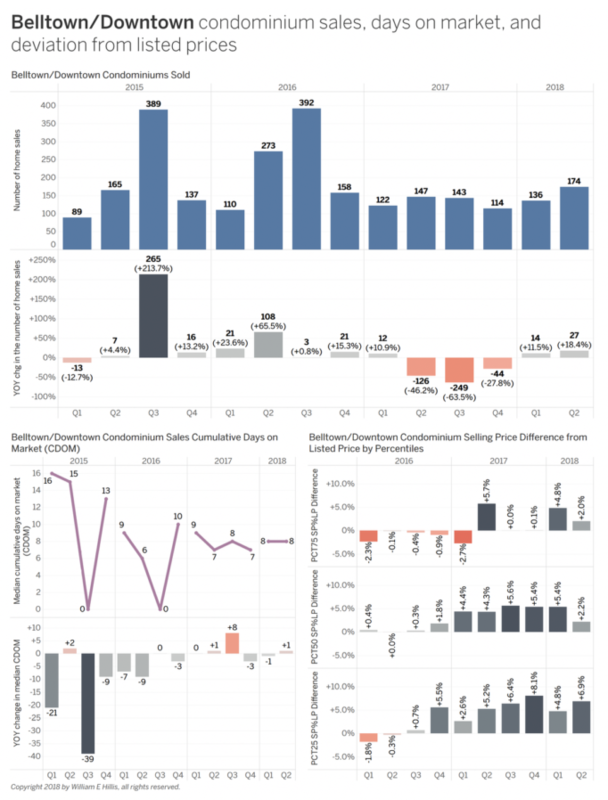 (Charts, “Belltown/Downtown semiannual condominium selling statistics: resales only”). 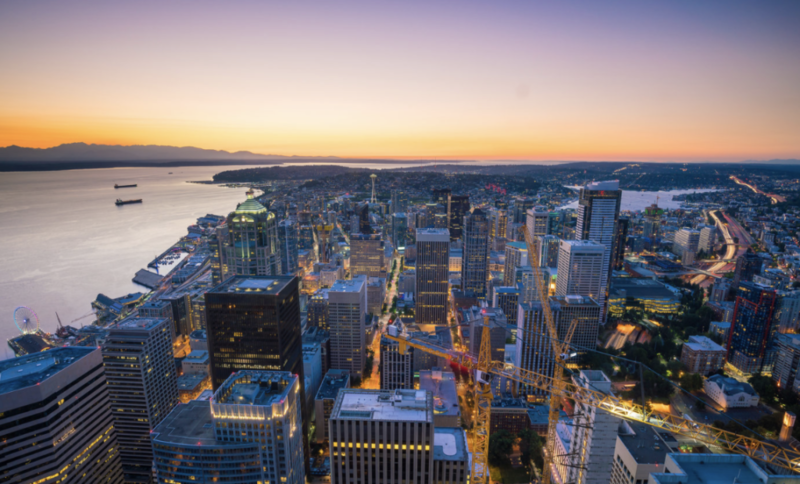 The combination of high and still-unmet demand for downtown Seattle condominiums assuages any concerns that units might go unsold, or at declining unit prices. Today’s sellers of existing stock are expected to field multiple offers at lower price points, and enticed by the latest projects downtown, many are likely to end up buyers again themselves. Eric Scharnhorst, Principal Data Scientist, Parkingmill, Quantified Parking: Comprehensive Parking Inventories for Five U.S. Cities, Research Institute for Housing America, May 2018.